Three 16th century Flemish tapestries which hang in an historic South West country house are to be restored thanks to the Heritage Lottery Fund. The tapestries, which hang in Mount Edgcumbe House in Cornwall, depict game park scenes. The restoration will last up to three years and will be carried out with the help of a £49,700 grant from the Heritage Lottery "Your Heritage" Fund. 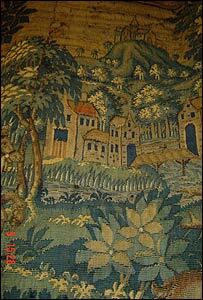 They are believed to be the only tapestries of their kind in the region. A bid was made to the fund after a recent conservation audit found that the tapestries are in urgent need of restoration. As part of the project an interactive web diary of the restoration process will be set up, as will education workshops in the house for primary school children studying the Tudors. Museums Development Officer Kate Johnson said: "We are so pleased to have been successful with this funding bid. "It means that we are able to restore these very old and precious items which have so much to tell us about the past. "The restoration will take up to three years and will involve the tapestries travelling to Belgium to be cleaned." Mount Edgcumbe House and Country Park is jointly owned and managed by Plymouth City and Cornwall County Councils.